Mark Hughes fumes with Southampton's start at Manchester City. 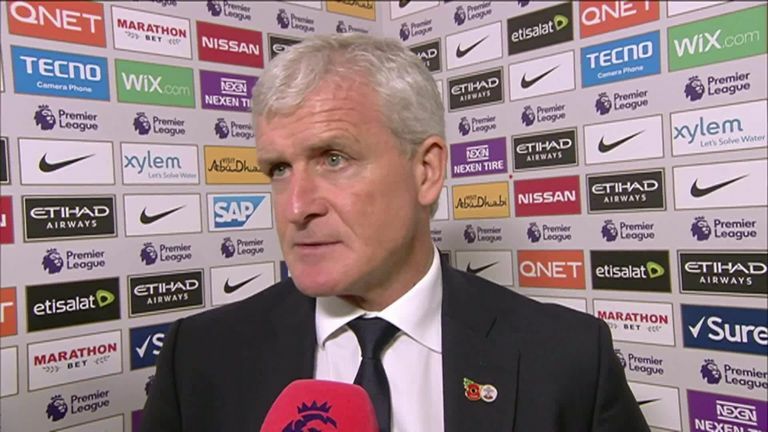 Mark Hughes was angered by Southampton's slow start at Manchester City where they went 3-0 down inside 18 minutes. Things got worse for Southampton, instead, and they ended up on the wrong end of a 6-1 thrashing - but it was the slow start that upset Hughes the most. "That is the game gone right from the outset," he said. "Any other work you have prepared and the game plan you want to implement goes out the window. "It is difficult when you are down. You can't over-commit because Man City have the ability to run over the top of you and it gets even more embarrassing. "The scoreline is not a result we take any pride in, but the fact we were trying to create chances when the game was gone shows the character was good." Southampton scored their first goal since September 17 through Ings' spot-kick and could have had more but for some wayward finishing at the Etihad. Hughes said: "The disappointment for us is that if we were a little bit resolute, and better defensively collectively, not just the guys at the back, I thought we caused them problems going forwards. "It could have made the score-line a little more palatable, we were never going to win after the start we gave them."